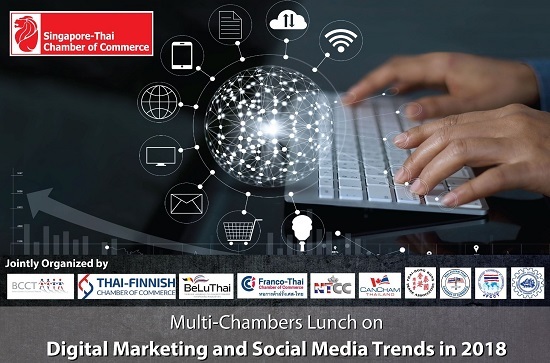 STCC in collaboration of Multi-Chambers, cordially invite you to attend Multi-Chambers Lunch with Jayson Ho, Celestia Faith Chong, Matt Mayer and Russalie Datu in discussing 'Digital Marketing and Social Media Trends in 2018 and the benefits of Social Media Influencers'. The panel will discuss the latest trends of Digital Marketing and Social Media in 2018 together with the ways companies can better utilise these trends in their marketing strategies as well as the benefits of social media influencers. Cost: THB1,000 for members of BCCT & participating chambers. THB1,500 for non-members. This price includes a 3-course Western set lunch.